Walk into the typical Australian kitchen, and you’ll find cupboards on the top and another row of deeper cupboards with a drawer or two below. But as you may have noticed while exploring your kitchen options, more homeowners are choosing drawers over cupboards – especially when it comes to below-the-waist storage. Should you install drawers instead of cupboards? Or are cupboards the better choice? 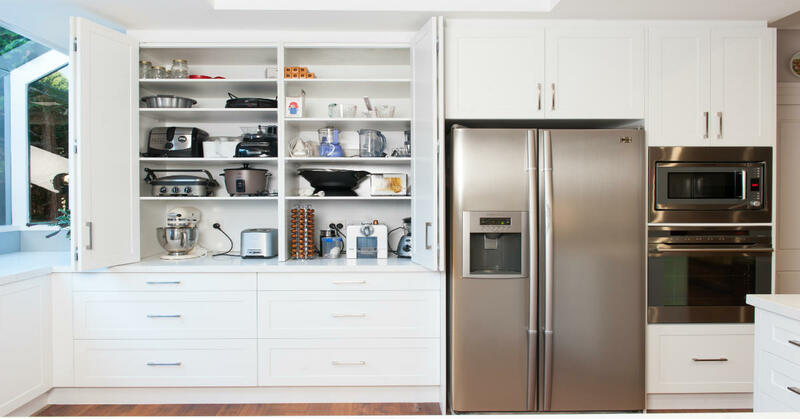 The team here at Zesta Kitchens wants to make sure you design the best kitchen for your lifestyle, which is why we’ve put together this post laying out the pros and cons of kitchen drawers and kitchen cupboards. The kitchen cupboard is a piece of furniture outfitted with shelving designed to hold a variety of items like cups, dishes, and cookware. Kitchen cupboards offer loads of shelving for a variety of items like plates, bowls, water glasses and cups. It’s easy to organise and arrange items in a cupboard, which helps prevent them from becoming damaged. Grabbing something from the back of a cupboard can be a huge hassle. Shuffling through things also means your items are more likely to fall over or fall out which can result in things breaking and spilling. Another major plus for the kitchen cupboard is its durability. Drawers can come off the rails and can become “sticky”. Using good quality drawer runners such as Hettich will stop this from happening but are more expensive. Cupboards, on the other hand, may only need the hinge replaced after several years of use, a task which can be completed in five minutes or less. Zesta Kitchens have a lifetime guarantee on all hinges. Though this really depends on your sense of style and taste, many homeowners find cupboards less attractive than drawers. Because kitchen cupboards only have one board for the face, they are a lot less expensive to buy than a drawer which has five pieces and a rail system. If you’re remodelling your kitchen in hopes of increasing the resale value of your home, then you may want to consider a more contemporary drawer system. The kitchen drawer is a sliding horizontal compartment which is pulled outward for access. No one likes having to hunker down on the floor and rummage through a load of things to get to something at the back of a cramped cupboard to find what they need. This is the leading reason why homeowners are swapping lower cupboards for drawers. Everything you need is at your fingertips. Having drawer runners that extend to the full length of cupboard provides the best accessibility. An obvious drawback, of course, is that drawers aren’t easy to access when set above the waist. That’s why the majority of homes install cupboards or open shelves for upper storage. With drawers, you can easily organise small items like utensils by using trays, boxes, and building custom compartments. Larger items like pots are also easier access with drawers as you don’t have full out any pots at the front to get to the ones at the back. As convenient as it may be to store cast iron pots and heavy appliances in drawers, over time these heavier items can cause your drawers to sag and fatigue. This is why it’s worth spending a little more on high quality drawer systems, like the ones we use at Zesta Kitchen. If you are planning on using a drawer for storing heavy items, it’s important that larger capacity drawers with higher weight limits are planned during the kitchen design phase. This is one area where getting advice from an experienced kitchen designer is critical. If you’re designing a more contemporary kitchen, drawers will give your kitchen that modern feel you’re looking for. Drawers are more prone to damage because they operate on a rail system. If the face of a drawer becomes detached, replacing it can also be a challenge. Using high quality drawer systems, like Hettich, will help stop this from occurring. At Zesta Kitchens, we only use Hettich drawer systems as these have the longest guarantee. Which system should you choose for your kitchen? Cupboards may be a better storage option for some, but for storage below the waist and a more contemporary design, drawers are a great choice for homeowners. 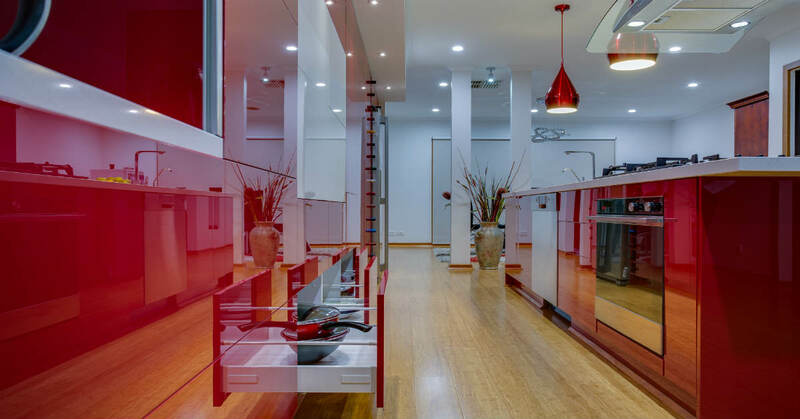 Not sure which is right for your kitchen design project? Get expert advice and book a free in-home kitchen design consultation with a Zesta Kitchens designer. We invite you to contact us online or give us a call today at 1300 100 555.